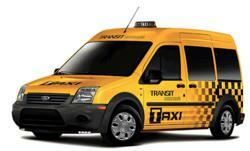 Includes first accessible Ford Transit Connect taxi approved in Philadelphia. This is the ultimate accessible taxi - for fuel economy, accessibility and practical use with all types of passengers. The Philadelphia Parking Authority, the organization which oversees all taxicab regulations and operations in the city of Philadelphia, has approved three new wheelchair accessible vehicles for taxi use – all built by MobilityWorks Commercial of Akron, OH. Many taxi companies are now looking for effective taxi vehicle alternatives, and these new choices include the Dodge Grand Caravan, Toyota Sienna, and the first accessible Ford Transit Connect approved for use in Philadelphia. All three of these newly approved vehicles have been successfully crash tested to give drivers and riders the highest levels of safety. Plus, they all average over 20 miles per gallon of fuel economy in combined driving, which is as much as a 50% improvement over the former standard taxi, Ford’s Crown Victoria sedan. MobilityWorks has been building wheelchair accessible taxis for companies throughout the United States for the past three years. They continue to develop new vehicle platforms and product innovations, like the exclusive Flex-Flat Ramp, specifically for the taxi industry. The Flex-Flat Ramp folds flat when not needed, giving the rear of the van a trunk-like deck for luggage, golf clubs and other cargo. This ramp was designed based on input from Taxi operators, and has created the most versatile taxi available – one which can be converted from accessible to standard in seconds. For more information on MobilityWorks’ wheelchair accessible Taxis, visit http://www.MobilityWorks.com/taxi or contact Michael Shank, General Manager – Taxi, at 800-769-8267 or mshank(at)mobilityworks(dot)com. MobilityWorks Commercial is the leading builder of wheelchair accessible vans, minivans, taxis and shuttles in America. MobilityWorks Commercial has Ford’s largest mobility bailment pool with E-Series units in stock and among the fastest lead times in the industry. Every vehicle available is compliant with FMVSS, OEM & ADA standards, including crash testing and seat pull testing. More information can be found at http://www.MobilityWorksCommercial.com, or call Jim Cermak, MobilityWorks Commercial Marketing Specialist at 330-861-1118.